There's no reason to wait and order our Italy DVD by mail when you can see the most popular videos that cover our most popular destinations right here. Experience the best of our Hawaii tours right here. Steve Perillo's own advice on every aspect of travel in Italy. Shown on TV and right here- covering the last few years of our most popular commercials. 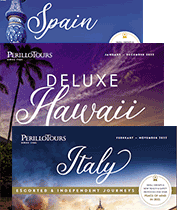 Perillo Tours sponsored half-hour documentaries on the history, culture and beauty of Italy. Created by our friend Kathy McCabe from Dream of Italy.